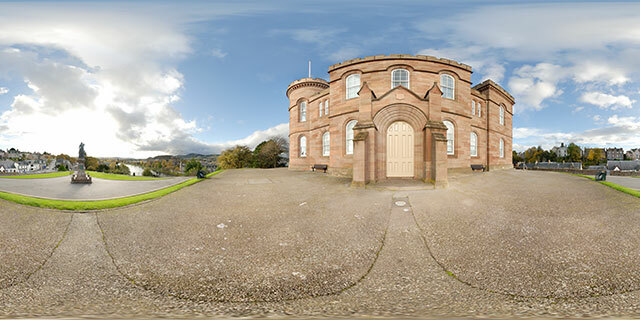 360° VR panorama of Inverness Castle in Inverness, Scotland. Inverness Castle (Scottish Gaelic: Caisteal Inbhir Nis) sits on a cliff overlooking the River Ness, in Inverness, Scotland. The red sand stone structure evident today was built in 1836 by architect William Burn. It is built on the site of an 11th century defensive structure. Today, it houses Inverness Sheriff Court. There has been a castle at this site for many centuries. The castle itself is not open to the public but the grounds are. A statue of Flora MacDonald is placed outside the front of the castle. Flora is remembered for helping Bonnie Prince Charlie escape capture after he lost the Battle of Culloden. 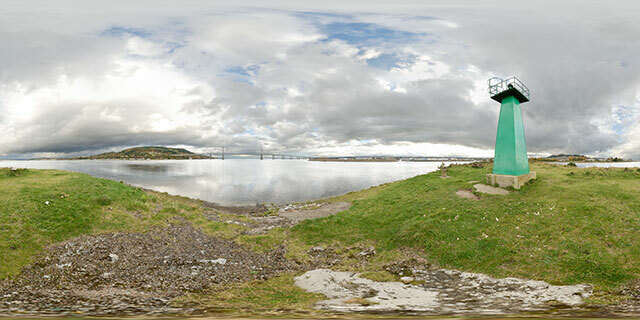 360° VR panorama of Carnac Point, in South Kessock, Inverness, Scotland. A small navigation light tower is situated on the point, which extends out into the Beauly Firth. To the south-east of Carnac Point is Inverness Marina and the end of the River Ness, while the Kessock Bridge is across the water to the north-east. The prominent hills nearby are Craig Phadrig to the south-west, and Ord Hill to the north. 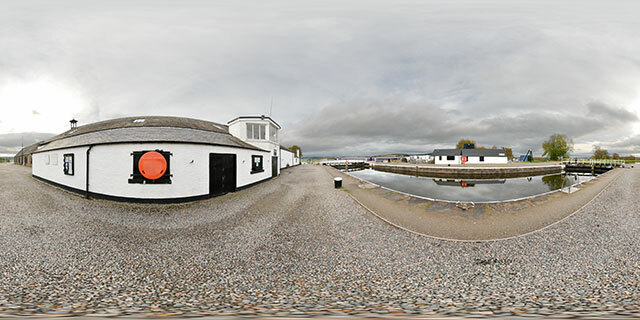 360° VR panorama of the small jetty by Clachnaharry Sea Lock, at the eastern end of the Caledonian Canal, Inverness, Scotland. The Caledonian Canal runs along the Great Glen, from Inverness at the east coast of Scotland to Corpach on the West coast. The Sea Lock opens up onto the Beauly Firth, and is the northernmost point of the British Waterways canal network. From this point can be seen Kessock Bridge to the north-east, Ord Hill, North Kessock, and Charlestown to the north, and Craig Phadrig to the south-west. 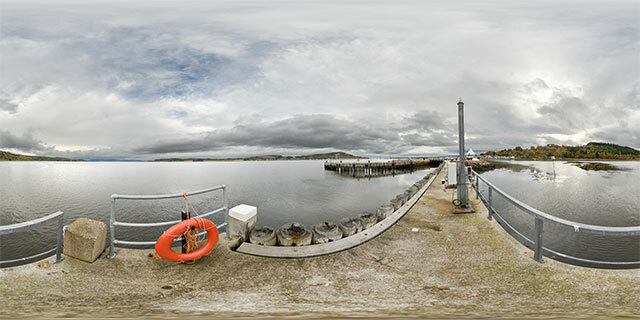 360° VR panorama of the Works Lock at Clachnaharry, in Inverness, Scotland. The Works Lock is the second lock on the Inverness side of the Caledonian Canal. The canal runs from Inverness at the east coast of Scotland to Corpach on the West coast. There is a railway swing bridge at the north of the Works Lock, while the Muirtown Basin is to the south. The lock is owned and operated by British waterways, nearby are various buildings used as canal workshops. 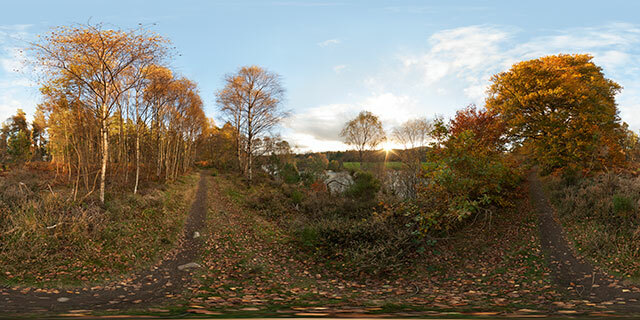 360° VR panorama at sunset on a path along the River Beauly near Kilmorack, Inverness-shire, Scotland. The large oak tree and nearby silver birches’ golden autumnal leaves glow in the warm sunset light. The space among the trees is coloured brown with dying ferns. Nearby small patches of heather grow alongside the path. The path is a well worn mud track, showing the route is fairly popular with walkers. 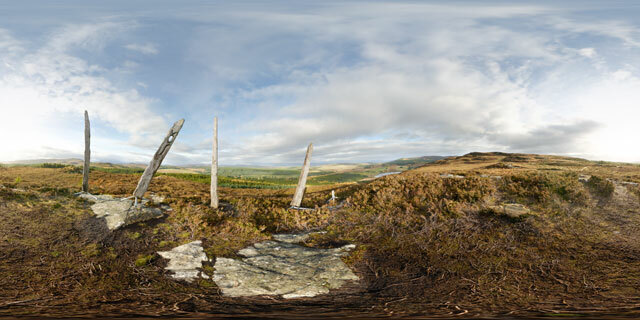 360° VR panorama of the viewpoint near Carn na Leitire in the Abriachan Forest, Inverness-shire, Scotland. A modern sculpture made from carved wooden poles inserted onto metal bases is located at the viewpoint. The viewpoint provides a good view of the Affric mountains to the west. The Abriachan Forest is one of the largest community owned forests in Scotland, being owned and managed by the Abriachan Forest Trust. The trust aims to create local employment through the forest management, while improving the environment and planting more native species of trees and plants. A network of trails has been built by the trust, and they also provide education opportunities for schools and various other groups. 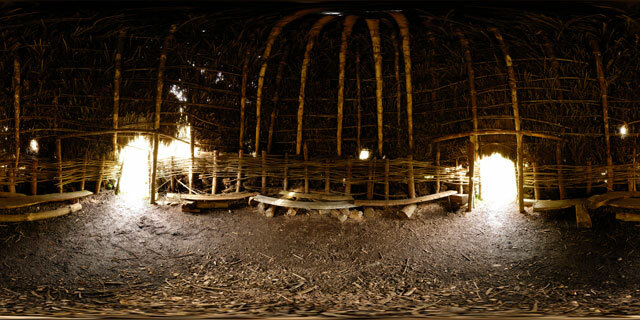 360° VR panorama of inside a reconstruction of a Bronze Age hut in the Abriachan Forest, Inverness-shire, Scotland. The Abriachan Forest is one of the largest community owned forests in Scotland, being owned and managed by the Abriachan Forest Trust. The hut gives a glimpse of what dwellings were like in this area during the Bronze age. Although there are small windows in the thatched roof of the hut, it is very dark inside. 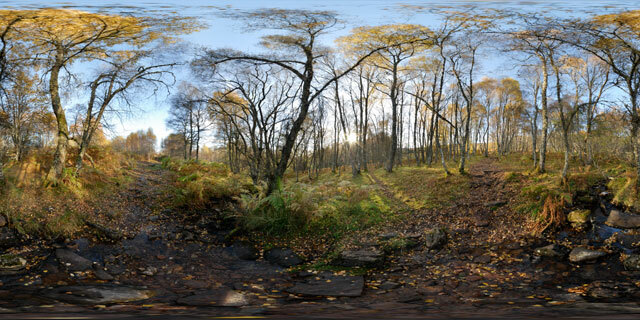 360° VR panorama of a stream through the woods near the bottom of Meall Fuar-mhonaidh, Loch Ness, Scotland. The woodland is mainly comprised of Birch trees in their yellow autumn foliage, with their trunks and branches covered in Lichens. 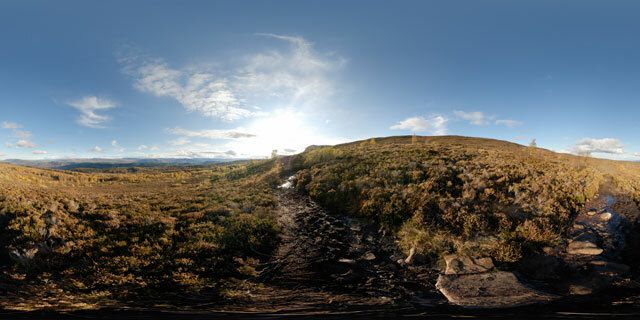 360° VR panorama of the path going through the heather part way up Meall Fuar-mhonaidh, near Loch Ness, Scotland. Birch trees in their yellow autumn colours can be seen down in the valley below. Meall Fuar-mhonaidh is the most prominent summit around Loch Ness, with the summit having a height of 699 metres above sea level. 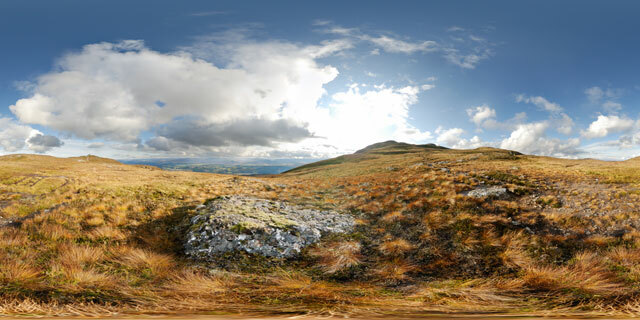 360° VR panorama of the view from part way up Meall Fuar-mhonaidh, near Loch Ness, Scotland. This part of the hill is covered with grass tufts in their orange-brown autumn colours. Meall Fuar-mhonaidh is the most prominent summit around Loch Ness, with the summit having a height of 699 metres above sea level.